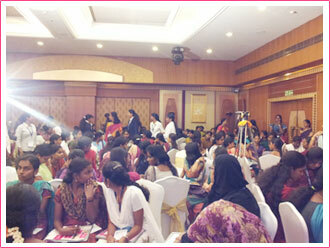 eWIT conducted Entrepreneurship Program for over 200 Women students. eWIT, at the request of ICTACT and GKM College of Engineering and Technology’s Alumni Assn and Entrepreneur Development Cell, conducted a two hour session where more than 200 women students from 20 different colleges participated. eWIT, at the request of ICTACT and GKM College of Engineering and Technology’s Alumni Assn and Entrepreneur Development Cell, conducted a two hour session where more than 200 women students from 20 different colleges participated. In order to make the session an interactive and thought provoking one, the students were divided into 20 groups and each group was asked to deliberate on a question that was relevant to entrepreneurship. The answers given by each group were discussed and further elaborated to the students by experts from eWIT, Ms Vijayalakshmi Rao, and Ms Sarada Ramani. Ms Indira Jagan and Ms Jayalakshmi, Governing Council members of eWIT who are In-charge of Academic Initiative, and Ms Kalyani Narayanan, President, eWIT, and Ms Bhuvana, eWIT Secretariat, also helped in conducting this event. The format was an overwhelming success and it was welcome by the students as well as the organizers, the Alumni Association and Entrepreneurial Cell of GKM College of Engineering and Technology.